Hud – Did You See That One? Screenplay by Irving Ravetch, Harriet Frank Jr.
Hud Bannon (Newman) has clashed with the people closest to him for as long as anyone can remember. When his father (Douglas) acts on principle it further opens the divide between them. Now their longtime feud threatens to destroy the few bonds remaining on the small ranch. This 1963 movie was adapted from the Larry McMurtry (The Last Picture Show) novel Horseman, Pass By which was published in 1961. The screenplay was completed by Irving Ravetch (Norma Rae) and Harriet Frank Jr. (Hombre), and the film was directed by Martin Ritt (The Sound and the Fury). Ravetch and Frank would earn an Oscar nomination for Best Adapted Screenplay, while Ritt would also be nominated for Best Director. The movie stars Paul Newman (The Hustler), Melvyn Douglas (Being There), Patricia Neal (Breakfast At Tiffany’s), and Brandon De Wilde (Shane). The story for this film is a wonderful drama built around the end of an era. The themes for the film are nicely illustrated through the hardships and successes of the characters. The small town of the story has an all-American feel to it that really seems to bring a forgotten era to life. It serves as a wonderful backdrop for the unique personalities presented in the movie. The writing also features some great dialogue including some fierce exchanges between Newman and Douglas. Those moments shine in a movie that seems to start slowly and build momentum as it thunders through the finish. The acting centers around the performances of the four main stars in this one. 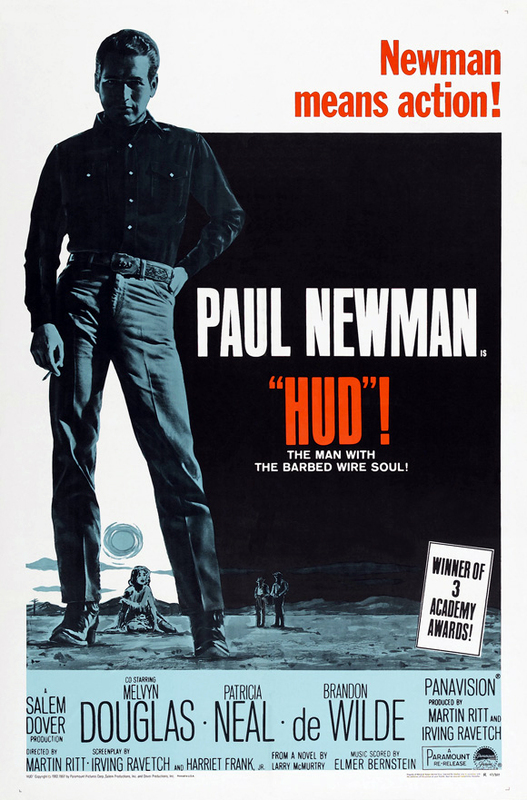 Paul Newman does a wonderful job playing a selfish and intense young man. His role called for him to bring out all of the worst qualities in his role, while maintaining a sense of charisma. This provided him with a chance to essentially play a character in two separate ways. The result is a blend of scenes that really bring his role to life. Paul Newman would earn an Oscar nomination for Best Actor for this one. It’s also clear that Newman was pushed by the incredible performance of Melvyn Douglas. His work brought out the extreme differences between the roles. Douglas also seemed to find the deeper emotional context of his role and tapped into it at all the right moments. He would later win an Oscar for Best Supporting Actor for this one. Patricia Neal and Brandon De Wilde add great work of their own to this one. Neal did great work finding the right way to connect to all of the other stars in this one. She brought out a different kind of chemistry with each of the other stars. Her performance is brutally honest and shows a woman with a tough exterior who’s hiding a deeply troubled past. She would earn an Oscar win for Best Actress for her work. Brandon De Wilde also does a great job in a role that asked him to hold his on opposite the great Paul Newman. Overall, these stars all brought the right energy to the film. This movie doesn’t just have great performances and a great story. The visuals in this movie are an amazing collection of shots that bring the culture of the film to life. Cinematographer James Wong Howe (Sweet Smell of Success) earned an Oscar for his work on this one. The camera work seemed to find just the right moments to get in close. The locations seem perfect for this story, and the costumes just add to the authenticity. The movie earned a seventh Oscar nomination for Best Set Decoration. The score, written by Elmer Bernstein (My Left Foot) is one more great aspect of this very complete film. With all of the nice aspects coming together, this is a very solid film. This is a must-see movie for fans of Paul Newman. Like The Hustler this movie gave Newman a complex character to work with, and the results are wonderful. This movie flirts with Western themes but it’s best described as a drama. For fans of films like The Last Picture Show this is one to see. I give this one 5 out of 5 stars.